The Secret History is the concluding part of the Locum Doctors trilogy, the story previously set up in The Defectors and Last of the Cybermen. 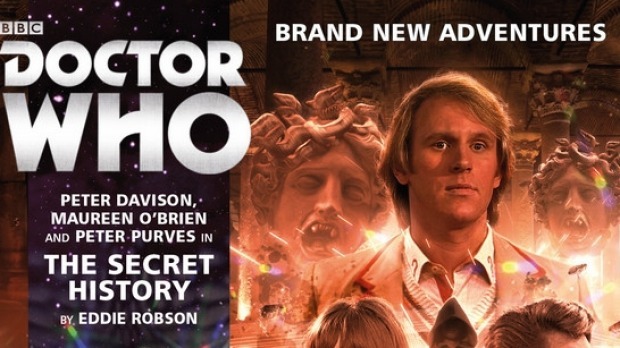 It is a very clever story which combines the story tropes found in both the First Doctor and Fifth Doctor stories and gives each character plenty to do. And it is always nice to hear Maureen O'Brien and Peter Purves as Vikki and Steven. Author Eddie Robson assembles a stellar cast with Lysette Anthony as Sophia and Tony Millan playing a double role as both Procopius and Yazid. Both of them steal the show, with Sophia and Procopius instantly being likable characters, it is a shame we won't be hearing more from Lysette Anthony as Sophia in the future, I would have liked to hear her as a companion. There was defiantly room for that here. The story mixes the comedy of some of the Hartnell historicals, from The Romans and The Time Meddler with the seriousness of the others in a pleasing manner. The story gives each character each enough to do and as the story progresses the difference between the Doctor at its centre becomes more and more apparent and proves to be critical to the schemes of the antagonist. Speaking of antagonist, the villain for this story and the previous two is none other than the Meddling Monk, first seen in The Time Meddler and it is appropriate that Vikki and Steven should be the companions who come up against him once more. Playing the Monk is Graeme Garden who is reprising the role after his stint in the Eighth Doctor Adventures. Not having heard all the Eighth Doctor Adventures I assume the events that are addressed refer to the death of Tamsin Drew in the stories Lucie Miller/To The Death but this isn't an issue as if, like me, you haven't heard these stories he could be referring to anything. Garden clearly has a good grip on the character and once and for all dispels any theory that the Master and the Monk may be the same person. As always Peter Davison, Maureen O'Brien and Peter Purves deliver their dialogue with relish and are a delight to listen too. One of the joys of these stories are the pairings of the Doctor and Companions. The Seventh Doctor and Jo Grant, The Sixth Doctor and Jamie and Zoe. The Fifth Doctor, Vikki and Steven are a great team and it is a shame that we won't be hearing them all together again. Overall, The Secret History is a great story, which neatly ties together a trilogy that didn't start well and gives us a pleasing and well written tale which is easy to listen too. The history is interesting but isn't put to the fore which some will like. But it is really the regulars that steal this show!